"Chaos Theory" is arguably the most worked of any of the Collectors Edition, and definitely the most time consuming to create. This mouth piece was released in the 2013 series, and features 5 custom matching reversals. The body is built on solid Cobalt tubing, and is accented with hand crafted glass leaves, which are placed tastefully around the frame. This mouth piece was hand crafted by Odd Thomas from Minnesota, and features his signature. Each Collectors Edition ships with a complimentary deluxe storage case. 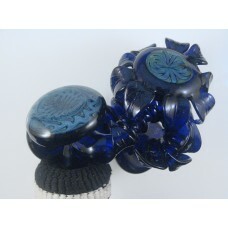 This glass hookah mouth piece is one of a kind. You will receive the item pictured.